So, following from earlier discoveries about the origins of this dish, today I have continued the learning curve. It seems the core ingredients that I mentioned to you yesterday are actually a more modern take on the traditional brandade recipe, and if I were bring you a recipe truly representative of Nimes cuisine, then my brandade needed to be stripped back to the bare basics. Again, another example in the French way, of few ingredients, cooked well, doing all the talking. 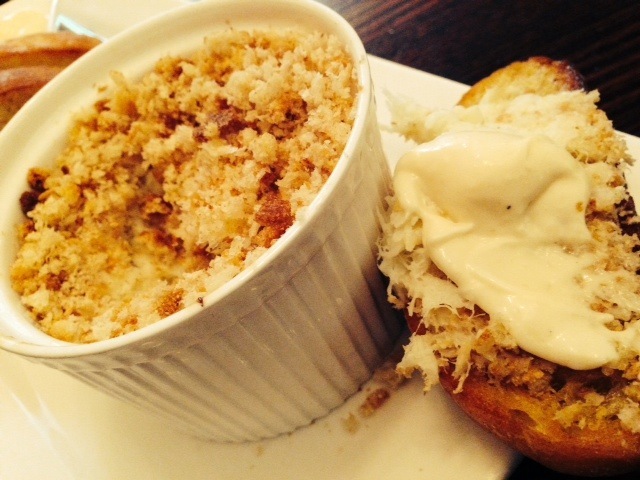 So what is in a Nimes Brandade de Morue? Well, you have the salted cod, some high quality olive oil, some milk and a few aromatics – but only if you want them. The dish is simple, delicate in texture and only mildly fishy which surprised me a lot. Still, a bit too fishy for me to rave about it, but tasty nonetheless. In keeping with the traditional theme, I did not use a food processor. It would have been much easier, and 10 minutes into my mashing and stirring I was seriously regretting not whipping out the machinery. In the end, I opted for what I suspect is a slightly more rustic looking dish than the recipe was aiming for, but hey I figure the French housewives of the 1800’s had more to do that stand around mashing fish all day! Recipe adapted from the French Virtual Cafe and Australian Gourmet Traveller. Note: you need to start this recipe at least 24 hours ahead of time. Firstly, desalt your cod. Place in a plastic or glass container and cover with water before storing in the fridge for at least 24 hours. Change the water at least 3-4 times during this time. When you are ready to use the cod, gently rinse it under cold water and place it in a large pan. Cover with cold water and add the aromatics and lemon juice. 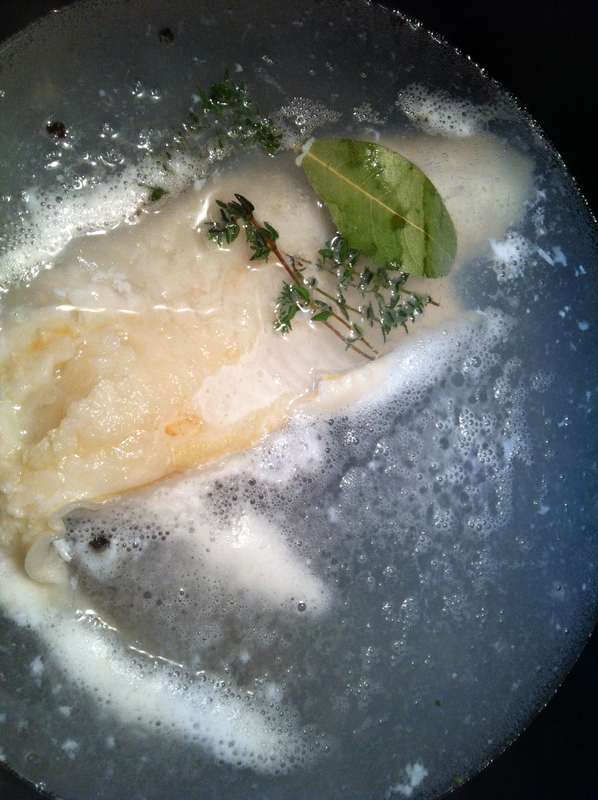 Gently heat the cod in the water as it warms towards a simmer. This should take about 8-10 minutes. Be careful not to let the cod boil at any stage! While the cod is poaching, gently warm (do not boil) the milk and the olive oil in two separate saucepans and reserve until needed. A bit gross… but you can do it! 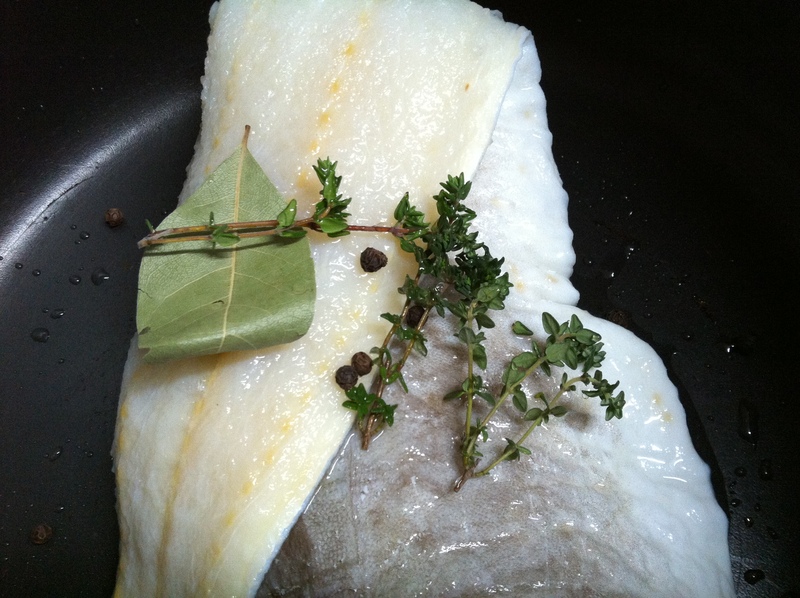 When the cod is poached, gently remove it from the pan and lay it on a board or bench. 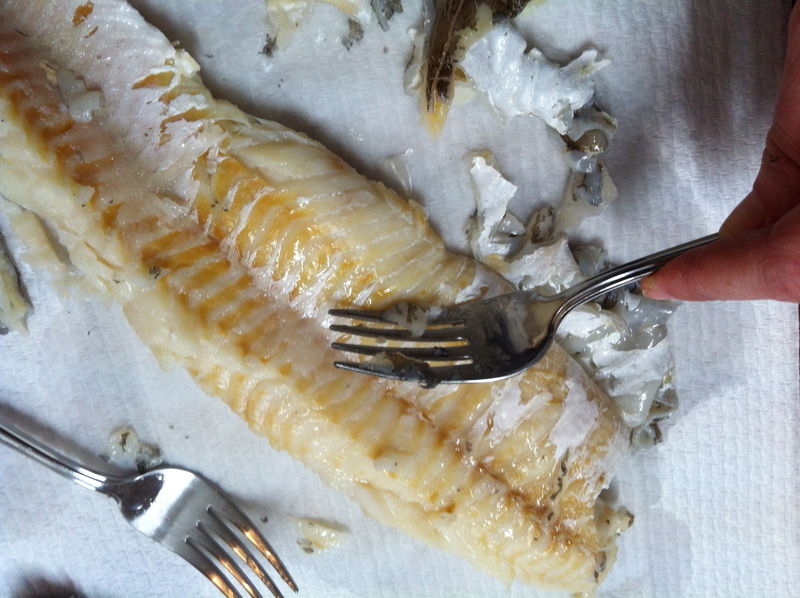 Quickly use the side of a fork to scrape the skin off the fish and use your fingertips to locate any left over bones (the cooked flesh will retract making this quite easy). Cod is quite bony and the big bones are pretty easy to find, if slightly annoying to remove, but hey we’re cooking fish. Mum and Dad always said I was a stirrer! Roughly flake the cod flesh with your fingertips and return it to the stove top over a very low heat (just to stop the flesh becoming rubbery and congealing as it cools). Add in a tablespoon of warmed oil and start stirring, mashing the cod against the sides of the saucepan as you go. Keep stirring, do not stop as you add a tablespoon of warmed milk, stirring until absorbed. 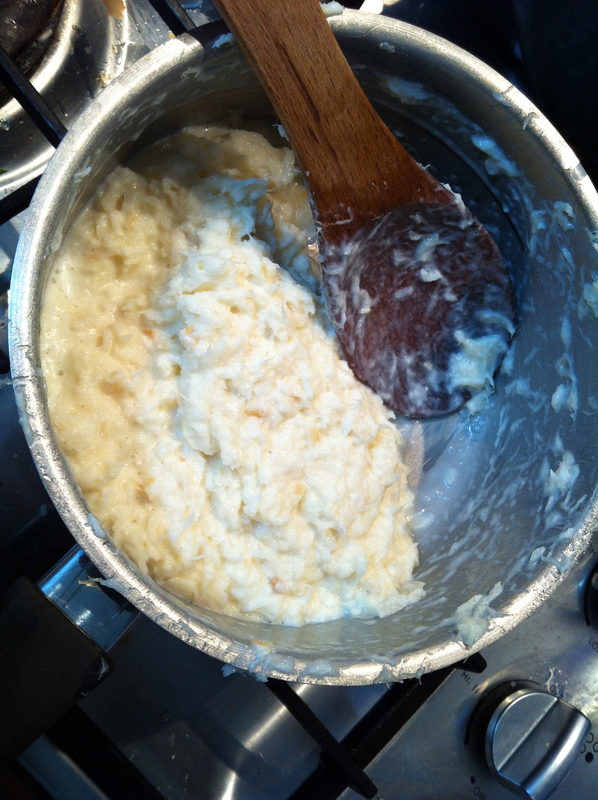 Keep alternating oil and milk and stirring until all incorporated and you cod mixture is (relatively) smooth. Note: You can do this in a food processor if you want to. 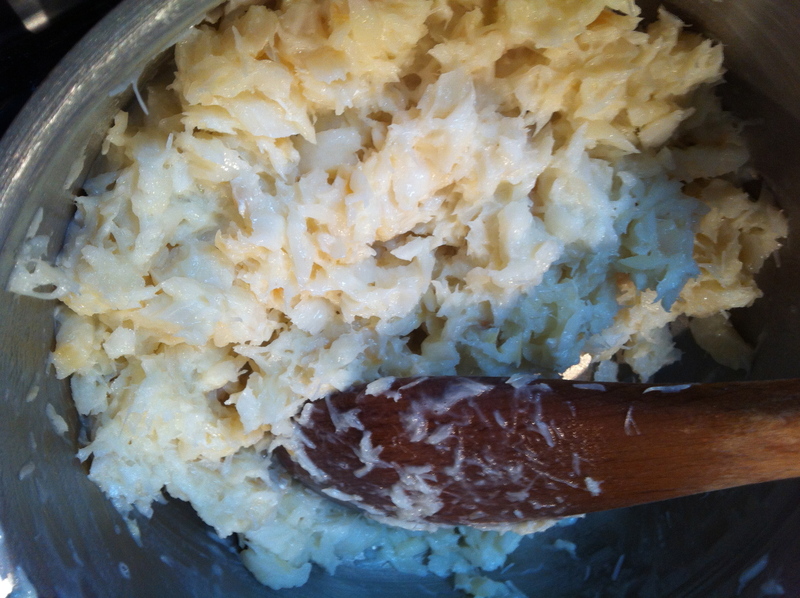 Process the flaked fish and milk in a food processor until well combined. And then, with motor running, slowly add olive oil in a steady stream and process until well combined and smooth. Whichever way you choose to make the cod emulsion, once it’s done you then need to season with salt and pepper and transfer to a serving bowl. Cover with breadcrumbs and bake in the oven at 180 degrees celsius for 6-8 minutes or until the crumbs are golden. 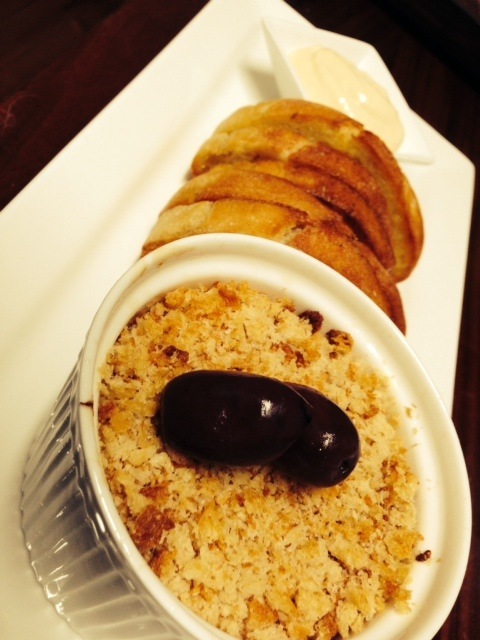 Garnish with a few olives and serve with aioli and crusty bread rubbed with garlic and fried in a little butter.